To purchase a Massage or Reiki session we will issue you a voucher and it will be valid for one month from day of purchase. Please ring the Aston clinic on 0208 9423148 to purchase or email us. "I highly recommend the�Aston Clinic�to Local Mums.�I was 34 weeks pregnant and at my last scan my baby was found to be in a breech position. I had heard about Acupuncture so I thought I would try the Aston Clinic as its local to me and I really wanted to have a natural birth and not go down the C-section route.�Liz the acupuncturist used moxibustion and the needles were placed in various actu-points on my body. Liz taught me how to use moxa and said to use it for 10 days and following this on my next scan the baby had turned. I was so happy as I am the youngest of three sisters who all had late deliveries and had intervention and C-sections (including my mum).�I ended up going into labour naturally at 39 weeks and I now have a fit and healthy six month old!" "I recommend the�Aston Clinic�to Local Mums.�The first time I visited Seren was nearly two years ago. I had a two year-old-girl whose immune system was quite weak after several cycles of antibiotics.�Seren understood the issue and gave us the correct treatment to burst the immune system of the little one. Since then my daughter’s health has improved enormously. She became much stronger and resistant and the symptoms of any illness became weaker.�Seren is a very professional and knowledgeable homoeopath; I would not hesitate to recommend her to anyone." Valentine's day is just around the corner, and if you are like me and wondering what to get or want to avoid the commercial parade of buying fluffy teddies, flowers, chocolates or anything holding a red heart! Why not treat your husband, partner, friend or even yourself to something different this year? Swedish holistic massage is a good all round technique with a broad range of benefits. Remedial massage tends to focus on specific muscular aches and pains. Acupressure involves manipulation of pressure points to affect areas beyond the reach of ordinary massage strokes. 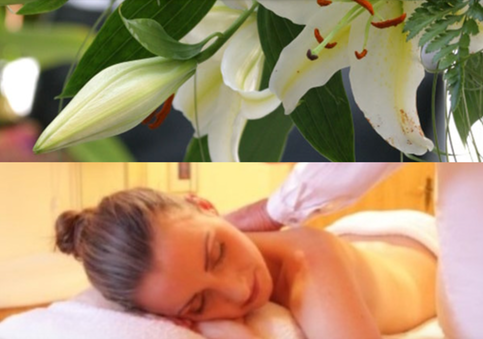 Aromatherapy uses essential oils to enhance all forms of massage. In practice these various techniques are often combined for maximum benefit. Massage is the simple, drug free natural antidote to stress anyone who has experienced a therapeutic massage will tell you that apart from its benefits, it is a uniquely relaxing experience. We are also offering Reiki which is a holistic therapy and is complementary to all medical treatments. �It aims to heal at the physical, emotional and spiritual level by restoring the body’s energy balance. �It can be used to relieve stress, headaches and migraines, emotional turmoil, depression, and much more. Birth is an amazing experience and an exciting new time for a family! However, there may be stressful moments for the baby and for you as new parents as you try and do all you can to comfort and help your child. Baby Reflexology is a wonderful treatment where as a parent parents, using Reflexology, you are able to comfort and bond with the baby through touch. It is suitable for babies over 4 weeks old. 3 week course, 10am – 11am at The Aston Clinic in New Malden, Surrey. Baby reflex is taught with your baby present. Each session for baby reflex is themed and designed to be easy to learn and remember. Each week you will learn new reflexes for the different areas and recap the previous week’s reflexology moves. 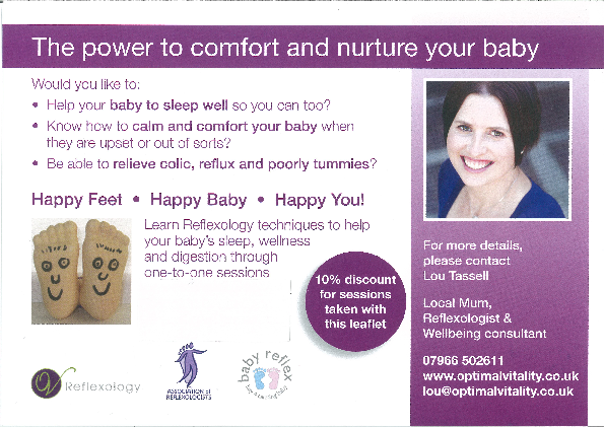 I am a fully insured Reflexologist with specialisms in Maternity and baby reflex training. I have been practising for 8 years and I am a full member of the Association of Reflexologists. �As a mum whose son has loved Reflexology since he was a toddler (and age 12 still asks for me to give him a mini treatment every night! ), I want to empower more parents to help their babies and children wellness in a nurturing, fun and natural way. Classes are baby led so feel free to stop and feed or change your baby etc. I have baby feet to use if your baby is asleep and you don’t want to disturb them! Course Fees: �50 for the 3 week course payable in advance includes notes and official baby reflex charts. Pregnancy back and hip pain? Lower back pain and pelvic pain is very common in pregnancy. Osteopathy can relieve back and neck pain and also help ease SPD symptoms. This is very common when the relaxin hormone starts to increase later in pregnancy. Osteopathy can also help after pregnancy in re-aligning your hips and help with the strain of carrying your child and also support a weak pelvic floor causing incontinence. This initial adjustment involves many bodily systems such as breathing and digestion. Stresses and strains from the labour or pregnancy can lead to unsettled behaviour with new born babies and difficulties with feeding, winding, colic, bowel movements and sleeping. Relieving any physical strains with gentle osteopathic treatment can be very helpful and relaxing for the baby. � � � � � Supporting the baby to find the best position in the womb in late pregnancy. � � � � � is in a breech position. � � � � � build. � � � � � Assisting the cervix to physically prepare for labour. Do you know what you can and cannot eat before and after pregnancy? A healthy diet during pregnancy is very important and often overlooked, this will help your baby to develop and grow well but it is also important for you to avoid gaining excessive weight and to avoid developing diseases such as gestational diabetes. �At the clinic we can tailor make a nutritional plan to help you during pregnancy but also support you after pregnancy to relieve symptoms of tiredness and fatigue and help with breastfeeding. After 12 weeks it’s safe to have a pregnancy massage, and it is a perfect way to relax and unwind and sooth any muscle aches as well as help you sleep. If you are interested in finding out more about our treatments for mums and babies you can contact us on 0208 9423148. Please note these treatments can be booked as a package but also seperately. Simone Benedetti, Nutritionist and PHD Researcher is running a FREE Diabetes workshop on Saturday 17th June at 10am. ​Simone will talk about the main risk factors, how to detect them and actions to take, it will also talk about the burden of diabetes over the world. This one to one consultation is only �10. The individual assessment will be run on the 17th June and also 24th June, please contact the Aston clinic on 0208 9423148 or email�hello@astonclinic.co.uk�to book your place.